A snaplink is used to join equipment, rope, and people into a functioning system (Figure 2-34). They are made of steel, aluminum, or alloys loose with a hinged, spring-loaded gate on one side. There are different sizes, shapes, strengths, and metal. The heaviest and strongest snaplink is made of steel. The weakest part of a snaplink is the gate. The gate must be closed before applying a load. Locking pins should be checked to ensure that they are not loose, worn, or corroded. When the gate is open, snaplinks should have little or no lateral movement of the gate. The metal should be checked for any cracks, grooves, burrs, flaws, or rust. 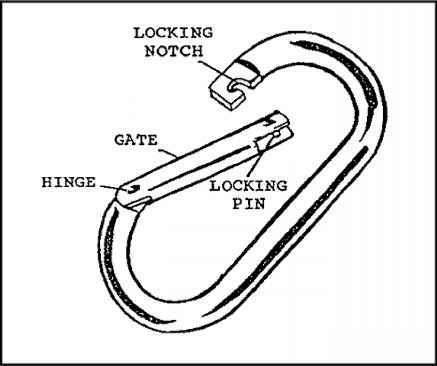 The spring-loaded gate should automatically close securely from an open to a closed position with no gap between the locking pin and notch. If an engraver is used to mark snaplinks, it should be applied only to the gate, never to the load-bearing side. A snaplink should never be side loaded (across the gate) since this reduces the overall strength to the point of gate failure. • The following data pertains to the standard military snaplink: Material: steel. Approximate strength: 2,000 pounds with the gate closed. Weight: 4.3 ounces. • Hollow snaplinks should be avoided since their use is limited. 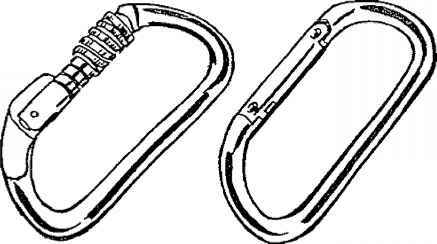 Some snaplinks have a locking mechanism with a threaded sleeve on the gate. The sleeve screws tightly over the gate opening end or hinge end to hold the gate closed (Figure 235). A locking snaplink is best when rapelling. A reverse locking gate is necessary to prevent a moving rope from unscrewing the sleeve. You should maintain the locking sleeve and threads free of dirt and grit; if the sleeve is forced to close, it may strip the threads. You should inspect the locking mechanism periodically since it will age and weaken after repeated use. The nonlocking snaplinks have the advantage of ease of operation, but they should be used only where they cannot be accidentally opened. • D-Shaped snaplinks are stronger than the oval type because the shape directs the largest part of the load to be applied to the longer, stronger side opposite the gate (Figure 2-36). They are made of steel or aluminum alloys, and there are different sizes and thicknesses, with or without locking gates. Strength and durability should be part of the selection process. Fl GUR E 2-36. D-Shaped Snaplinks. • Oval snaplinks are versatile and have a variety of applications (Figure 2-34). They are made of steel or aluminum alloys, and there are different sizes and thicknesses. Both sides of an oval snaplink bear the strain equally under load weight. Many modified ovals are available, most either with or without a locking gate. 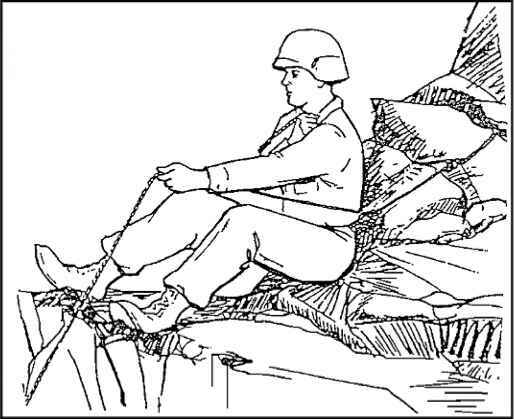 All snaplinks must meet military standards or the Union of International Alpine Association (UIAA) specifications. All snaplinks should be inspected and cared for daily, before, during, and after use. • Make sure the metal does not have cracks, grooves, burrs, rust, and flaws. Ensure that the gate opens and closes freely without binding; that there is no lateral movement when the gate is open; and the spring action snaps shut when released. Make sure the locking notch have a slant or slot so that the gate remains shut under the impact of a climber's fall. The pins should not work their way out of their holes and should not be shorter than their holes. If there is a locking mechanism, you must ensure the threads are not stripped and the sleeve locks the gate tightly. • You should not use the snaplink if burrs, grooves, or rough areas have been identified. You may use steel wool, oil, or solvent to rub off rust. Lubricate the spring as needed. To remove cleaning agents, which cause dirt to cling to the snaplink and rub off on ropes, from the snaplink, you should boil it in water for 20 to 30 seconds. It is better to use a lubricant that does not attract dirt such as a dry, graphite-based lubricant.